As you Embrace the Source, God, and respond to His love for you by trusting in Christ, you will have the foundation of purpose and power for your journey of living a life of significance. As you fully embrace an intimate relationship with your Creator, He transforms your life. If you sense the need for a personal, one-on-one conversation with any of the women as a result of this particular session, be open. If you feel that someone needs to hear the gospel or understand the ministry of the Holy Spirit, you may want to use the “Beginning Your Journey of Significance” booklet or “Living a Life of Significance” booklet during your conversation. Visual aid: To help review the previous principle, Pursue Your Uniqueness, show two kinds of containers to the group. One might be a cream pitcher and the other a measuring cup. Explain that both are useful and effective. The cream pitcher is more glamorous but limited in use. The measuring cup is not as beautiful but it is more versatile. Help them realize that both containers can be used to pour out our lives to the Lord. Explain that when we are in the presence of the Lord, His acceptance and love doesn’t depend on how we look. Encourage them to take what God has given to them and pour it out to Him. Law 1 – God loves you and created you to know Him personally. Law 2 – People are sinful and separated from God. Law 3 – Jesus Christ is God’s only provision for our sin. Law 4 – We must individually receive Jesus Christ as Savior and Lord. Place the “footprints” on the floor, or your flip chart, to represent someone walking on a path. Explain that these footprints represent the four steps to knowing God. Place the four “footprints” on the meeting table. Ask for four volunteers. Each woman, in order, will read the Law that is written on her footprint and also the rest of the content of that Law from page 41. After the four Laws are presented by the women, the facilitator will present the rest of the gospel presentation from page 42. Draw three circles on your flip chart to represent the conditions of man. Ask the women to share at the table, or around the room, about which circle they used to be in and when they moved from one circle to another. This allows for a non-threatening approach to revealing their spiritual condition. One facilitator shared with us what happened with her group as a result of this interactive activity. “Lynn freely and immediately said she was totally in the self-directed circle and shared some of why she knew she was. 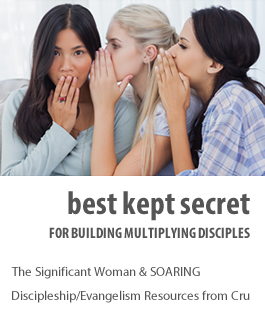 The gal across from her said she struggled with going between the Self-Directed and God-Directed circle. That led to a great but brief discussion. “After returning to the facilitator time, Lynn spoke up again and said she didn’t know if she even had a personal relationship with God. The gal next to her, Christen, agreed with her and said she didn’t think she had a personal relationship with God either. Visual aid: Do a “mime” (silent skit) performed by two people to demonstrate the difference between being filled with God’s Spirit and going one’s own way and ignoring God’s direction. Props: 7-10 circles cut from colored paper, one chair, and a long rope. Place the rope in a large circle around the chair. Woman #1 will be seated inside the rope, organizing the colored circles representing various interests of her life. She becomes overwhelmed and frustrated with the task. Woman #2, wearing white and representing Jesus, will approach the circle. Woman #1 will stand, smile at Jesus, and invite him inside the circle. “Jesus” will sit in the chair and show Woman #1 how to organize the circles in her life. When Woman #1 begins to understand the process, she will suddenly take control of her own life. She will begin picking up the colored circles and spreading them in a variety of places according to her own preference. No longer will she smile, but she will frown and look determined. She will gently pull Jesus from the chair and sit in it herself. She will stand up a couple of times and rearrange the circles. Eventually she will sigh and lift her hands in defeat. “Jesus” will come to her side and smile at her. She will stand up and motion for “Jesus” to sit in the chair again. Her face will become joyful and peaceful again. Set up an altar some place in the room with a candle and/or cross. Allow time for each woman to identify something they need to release to God. Following are two suggestions for creating a special meeting time with God. Activity materials: Small card and a butterfly card.Instruct them to write on the small card what they have identified to release. One at a time they will take their card to the altar, pray, tear it up and leave it there. Then they will pick up a butterfly card as a reminder of their freedom in Christ.